Will lives in Suttons Bay and spends much of his time in his store, fashioning jewelry and weathervanes and thinking interesting thoughts. 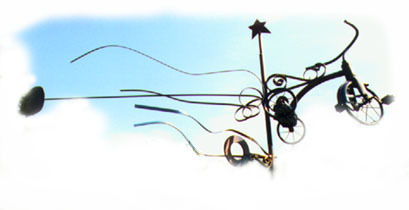 His weathervanes can be found on rooftops around the area, including Traverse City's new Visitor Center and at Case-Daniels Jewelry, 307 St. Joseph in Suttons Bay -- 271-3876. "Years ago, I thought that jewelry making was for, well....I injured myself while I was in the Peace Corps, and part of my theraputic process was weaving. While making hettles (the metal rings which hold the worp and weft of a loom), I began to twist them into rings. This earned the attention of beautiful women, which I found to be enormously enlightening at the time." "I guess the things that led me to the weathervanes were mobiles, which I mixed with jewelry to make these rather bizarre wearable pieces. I needed something that I could do outside, that could stand up to wind and weather. It's sometimes a relief and a release to be able to work on something large. jewelry can be a small and insignificant thing that gets tossed in the underwear drawer. With the weathervanes comes an architectural authority." "It's like calligraphy in the sky. A geometrical object, a sphere or other shape really doesn't change a whole lot as you rotate it. But when you take to lines, coil them, even a shift of only a couple of degrees can produce a dramatic change. Maybe that's why we love so much to run around in the yard at night, twirling a sparkler in each hand..."